Specialists in the field of Cycling Challenges, Adventure Café offer tours across the UK, Europe and worldwide. In addition to rides with professional cycle leaders, we also offer waymarked timed sportive events, which are ideally suited to Corporate Events. Both employees and clients alike will enjoy a well planned and executed challenge. With venues across the South of England to choose from, including venues suitable for large numbers of participants with event catering. Our range of riding destinations includes some of the most iconic routes in the South of England, from Cheddar Gorge to the Weald of Kent, and Box Hill to the Cotwolds and the Chilterns. We are proud of our event leadership team who will ensure your riders are carefully looked after, given careful briefings and supported with great feed stations, and the best mechanical support. Our events are tailor made to suit your requirements, and any destinations mentioned are just indicative. We can even offer sportives across the water in northern France and Belgium. Our routes can be offered in short, medium and long formats - from 25 miles up to 100. 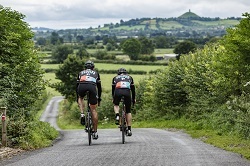 Jones Lang LaSalle Cycle Sportive 2013 from JLL UK on Vimeo. 14:00 Return to Event HQ for celebratory drinks & buffet food 15:30 Expected end of event, riders to depart for home. We can organise any element of a Corporate or Private Sportive. Typically this can be; Start Finish Venue, Breakfast, Feed Stations, Lunch, Waymarkers, First Aid, Support Vehicle, Multiple Route Choices, Mechanical Support, Emergency Support Telephone Number, Event Joining Information. For Larger Events, we are happy to provide a quote for Electronic Chip Timing Services and event photography. A full risk assessment is available for any of our events, with specific reference to the route selected. We use quieter roads as much as is possible, and we attempt to follow anti-clockwise circuits in order to minimise the number of turnings across traffic. Our knowledge and hazard identification has been a consolidation of years of cycling and adventure challenge management experience, and something we are very proud of. The event was a great success, with excellent feedback! Thanks to you all – it was an event that will live with us for the rest of our lives.